Discussion in 'Development Dispatches' started by moo1337, Sep 6, 2016. This development dispatch covers work completed since the Decred v0.4.0 release on August 15, 2016. Since then, developers have merged 49 pull requests into 8 repositories (see below for more detailed changes). 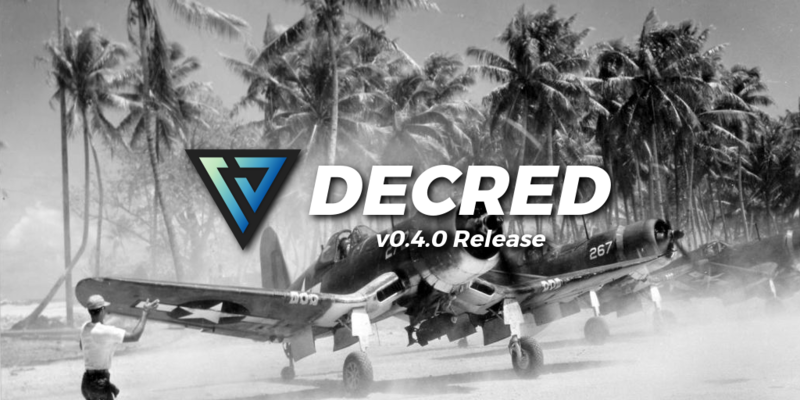 This release contains improvements and bugfixes for all of the decred tools (dcrd, dcrwallet, gominer, and Paymetheus). Notable changes include Paymetheus starting dcrd automatically in the background. This is also the first release to include desktop versions of the Copay GUI for OSX and Linux. This is also the first release built with the version 1.7 of the go compiler. This produces smaller and faster binaries than previous versions of go. The file cmd/dcrinstall/pubkey.go contains the decred public key which is used to check the signed manifest in the release. You can compare the contents of this file to what you get from a keyserver to confirm that dcrinstaller is using the proper key. The Decred installer will only work on Windows 7 and above. Reynold, Tivra, shoshin and 1 other person like this. Binaries updated without problems, good work devs ! Awesome to see decred progressing. But it's rate still need to get faster to attract inverters right? Jamie Holdstock and Tivra like this. Updated binaries on PoS, will now be updating GUI. Thanks for all the hard work, looks good so far! We will have a look at this. We have confirmed this bug and we are putting in a patch. We'll roll a patch release for this later today. We apologize and have taken corrective action. We have updated the 0.4.0 dcrinstall binaries and updated the signature to cope with this. So simply redownload 0.4.0 dcrinstall and run it as normal. Nothing else was affected; only dcrinstall! Great job in fixing this! Just upgraded using the decred-linux-amd64-v0.4.0.tar.gz package and there appears to be an issue with the getstakeinfo data. The output of my getstakeinfo command is showing 1 for allmempooltix when there are currently ~2270 mempool items. Is there any "getting started guide" that focuses on Paymetheus? I've been running dcrd, dcrwallet, and even stake mining from the command line from the beginning. I've installed Paymetheus and hooked it up to my actively running dcrd. What I'm trying to do is point to, or teach a person that is new to decred on how to set up and run a wallet from scratch and use Paymetheus as the interface.